TOP: The workbench is cluttered as usual! 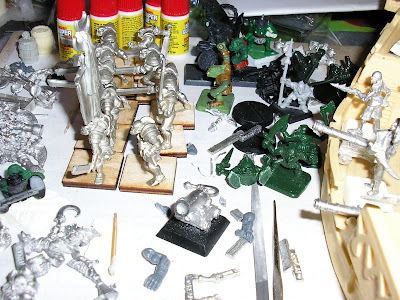 Well, any weekend I get to work on the hobby is a good one and I was able to spend a good amount of this past weekend working on miniatures projects. The above photo is of a 1'x1' project board loaded up with models. On the far right is a Flagship Games resin ship loaded up with some of my 28mm undead pirate crew. To the upper left of the photo are some armored orcs that I picked up cheaply awhile back. And most of the rest of that project board is covered with orcs that I am converting to become a 28mm fantasy pirate crew. As a side note, I picked up the "project board" practice from an old gamer buddy of mine named Kris. He would buy a cheap sheet of chipboard and have it cut up into rough 1'x1' sheets. The typical 2' x4' sheet yields eight "project boards" They're sort of like building puzzles on a flat piece of card board. By working on the "project boards" I save my tabletops and they make it easy to move projects around. At any rate, I found it a good idea years ago and am still using them to the present day. Thanks, Kris! I've also been saving spare plastic 20mmx20mm mini bases for my fellow blogger and gamer, Drunken Samurai. 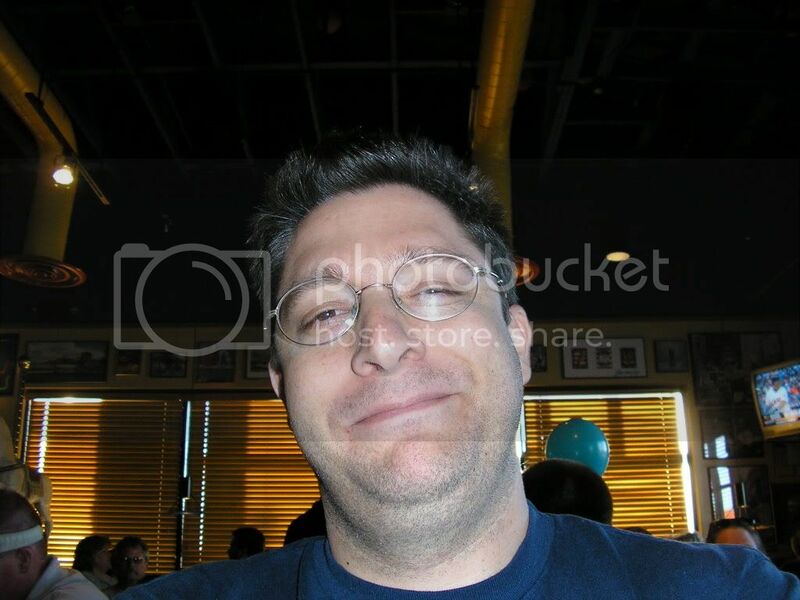 If you've never checked out his blog, I highly recommend you do so. He does some pretty neat work. Please excuse the low quality of the photos. I was having some difficulty with my digital camera and decided to go with low-quality shots rather than have none to share. TOP: 25mm Barbary Pirate crew - mostly RAFM Ottomans and pirates. Well, I'm up to almost 30 Barbary pirate figures at this point divided into two crews of fifteen men each. The above unit is mostly equipped with firearms. I got a deal on some old RAFM Turk and Ottoman figures so the latest acquisition really plumped out my tiraleurs (riflemen). The last batch proved difficult to work with, but this batch was a breeze. I'll update this post later with product numbers. I haven't found a good ship for these fellows yet, but I have an extra galley or two that might do the trick. 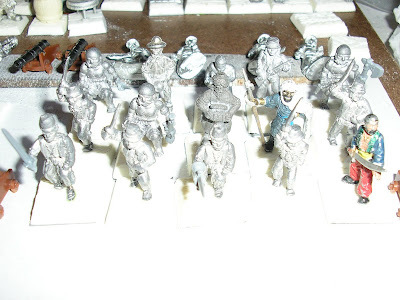 TOP: 28mm Barbary pirate crew: mostly old RAFM. The above lot is mostly a close-combat crew armed with cutlasses and various small arms. The two gorilla-like corsairs had their weapon swaps repositioned to stick straight up so that they'll rank better. 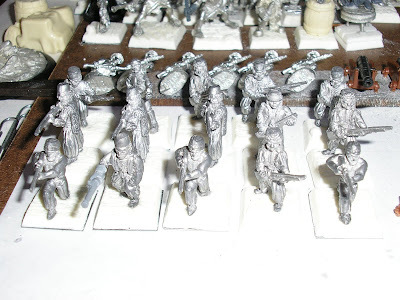 The RAFM figures are definitely older 25mm ones and they are puny compared to "heroic sculpts" of 28mmm or larger scale. 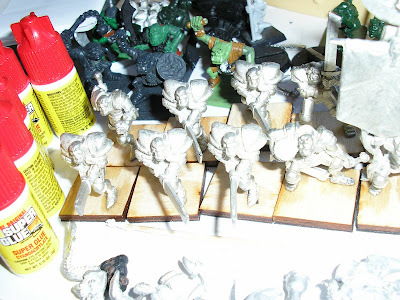 TOP: 28mm armored orcs ... in need of headgear! And the last batch if figures that I worked on have been orcs for my nephew Vincent's upcoming 28mm fantasy orc army. I picked up this batch of armored orcs used somewhere... I think that they are Harlequin / Black Tree although they might also be RAFM. I have a bunch of GW Bretonnian heads with nice medieval helms in my bitz box so I'm planning to add headgear to these fellows in the near future.